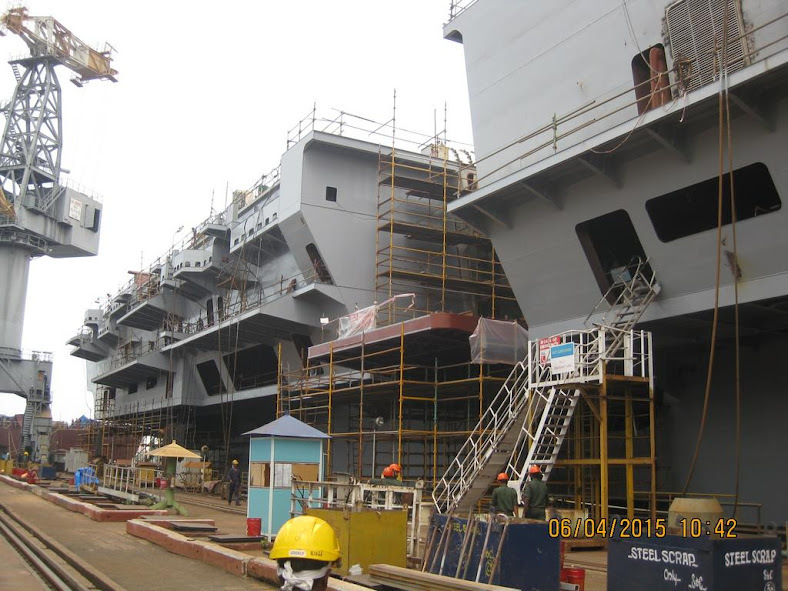 Undocking of INS Vikrant (IAC-1) has been pushed back to Monday, June 1, 2015. The aircraft carrier was to have undocked on Saturday, May 30 on completion of phase 2 structural build up. In preparation, the carrier - which will displace 40,000 ton on completion, but currently weighs just 26,000 tons - was loaded with ballast and flooding of the bay dock initiated on Friday, May 29, 2015. However, undocking had to be pushed back to Monday due to unfavorable tide, unforeseen accumulation of silt, and a problem with lowering the building bay dock gate, which was last operated when the ship was brought in a year-and-a-half ago. All major equipment has been fitted into the vessel, which has now acquired the shape of an aircraft carrier, with a finished hull. Following undocking, for the next year-and-a-half INS Vikrant would be fitted with abling, piping, accommodation facility, air conditioning and ventilation systems as part of Phase-2 construction. The equipment fitted on the carrier will be operated only towards the end of Phase-2 construction. Basin trials will commence in 2017 for eventual delivery in end-2018. IAC-1 was officially launched on August 12, 2013 with over 80% of the structure completed; the ship was fitted with its two LM2500 Gas Turbines developing a total power of 80 MW, diesel alternators capable of producing about 24 MW and main gear box. IDP Sentinel members can read more about IAC-1 at the link below. During a user field trial at Pokhran range near Jaisalmer on May 30, 2015 six Pinaka Mk-2 rockets successfully hit a target at 53-km range. 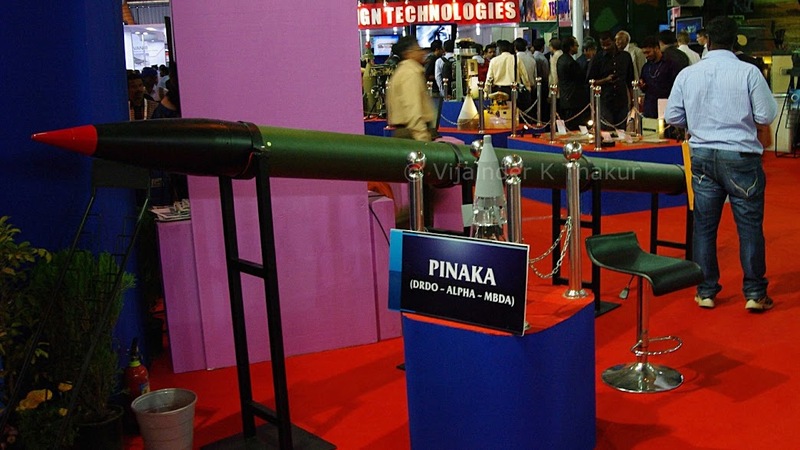 Earlier, DRDO's Armament Research & Development Establishment (ARDE) completed development of Pinaka Mk-2 following trials at the Chandipur range in Odisha from December 9 to December 12, 2014. A total of 20 rockets were fired in the four-day-long trial to ranges of 20-60 km. On an aside, Indian Army is planning to procure Extended Range Rockets for 122mm GRAD BM-21 Multi Barrel Rocket Launcher System (MBRLS). On May 21, 2015, the Army released a RFI to identify probable Indian vendors who can undertake the above project. Closing date for vendor response is July 1, 2015.